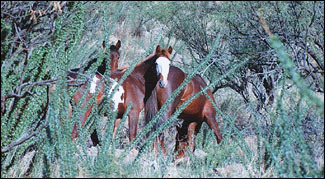 In order for these horses to keep their uniqueness and their long-developed adaptability to the desert/mountain conditions of the Southwest, some of these animals must be conserved in natural breeding groups. It is critical to breed them in their original eco-niches under the most natural conditions possible, as well as keeping them in more managed conditions. It is important that the long learned intelligence should not be lost, especially while many of the old foundation animals remain. The overall goal is to have a successful breeding program, increase numbers, maintain genetic diversity, and keep the great traits of this tough little horse intact, including their wonderful disposition. To achieve this goal the various breeders are working together. We want more people involved in starting small breeding groups, especially to get the old foundation mares and stallions in natural breeding systems while they are still of breeding age. A local reporter wrote a story on the "Return of the Wilbur-Cruce horse to southern Arizona". During the interview he asked me if I considered the Wilbur-Cruce horse to be the best of all strains. Of course not. When we are talking about biodiversity and genetic resources, we don't want to talk about "the best." We humans put on the tag "best." 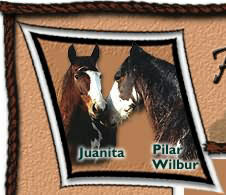 The Wilbur-Cruce horses were selected by nature to be best adapted to a particular ecological niche. Many, many species and breeds and strains of breeds make up the diversity and that is what is the "best."